Sweet and Sour Chicken Salad, gourmet summer salad recipes. In nonstick skillet heat oil and 1 tbs Teriyaki sauce. When hot add mushrooms and sauté briefly, about 4 minutes. Remove and set aside. Prepare lettuce and put into a large salad bowl along with chives. Toss with about half of the vinaigrette - it's quite thick so it takes a bit of tossing to distribute it well - be careful not to use too much to start. When it is to your liking, arrange chicken, asparagus, mushrooms and avocado artfully on top. 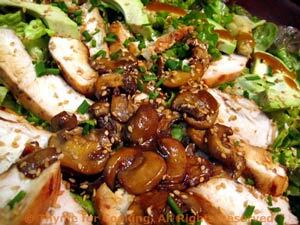 Drizzle with a bit more vinaigrette, sprinkle with sesame seeds, and serve with remaining vinaigrette on the side.